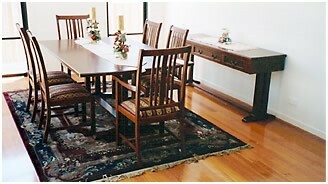 Peter Illing founded Illing's Own Fine Furniture in 1989 for the purpose of producing quality hand crafted furniture, which included the reproduction of antique furniture. We will design furniture to compliment our customer's decor. 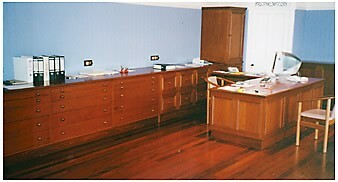 From the entry to the bedroom, we will design peices to meet the customers specific furniture needs. Our work is hand-crafted from quality timber & veneers to produce prestigious furniture of the finest quality which will be passed down from generation to generation. The office, whether in your home or in a commercial suite can be designed to meet the customer's specific & practical needs. We construct desks, bookcases and other items which maximise available office space, enhance the board/conference room & incorporate cable ducting & accessories. We also build Plasma TV lifts. Joinery & architectural work includes constructing feature entrances to an existing opening, internal doors & arches, wall paneling, double-sided bookcases to form walls & revolving bookcases to form doors. We are always happy to help our customers to bring their own ideas to life.